-- Para. 1865, Catechism of the Catholic Church, 1994. A wood stork faces adversity in the form of a ramshackle ladder leading to a nest that has seen better days, in a tree that is certainly rotten and laden with uncertain promise. A clearly pregnant child of the Woodstock generation flagellates an elderly bookish butler with the stamens of an Easter lily. Encompassing as it does, in twenty-six short epistles, all of the seven capital sins, An Illustrated Alphabet for the Illiterate is encyclopaedic in its reach and catholic in its taste. An exposition of the food chains of various ecosystems is interspersed with a fanciful bestiary of toucans and dragons, faeries and a unicorn and even includes a sympathetic depiction of polycystic ovary syndrome sure to strike a chord with the afflicted. The work of two illiterate elephants in the china shop of letters and language, An Illustrated Alphabet for the Illiterate attempts to be no more than what it is -- a bizarre and entertaining little book, fun to look at and fun to read! 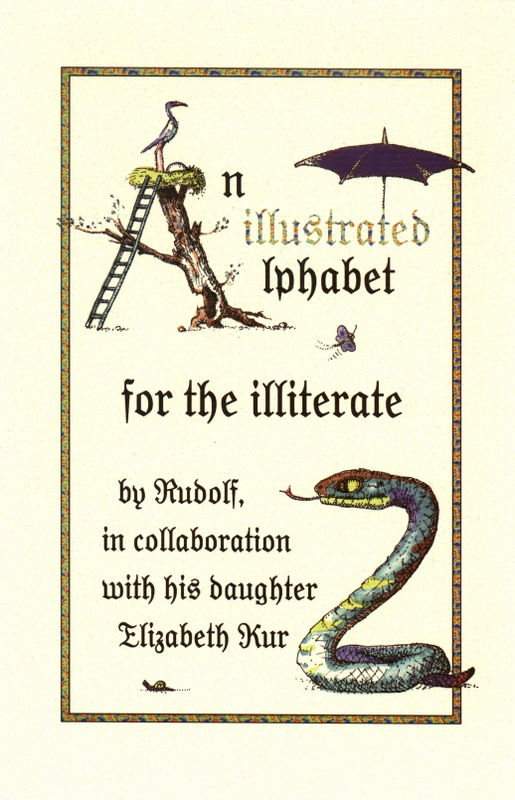 Rudolf (the artist) studied the letters of the alphabet from the point-of-view of an illiterate, unspoiled child and saw surprising shapes in them. 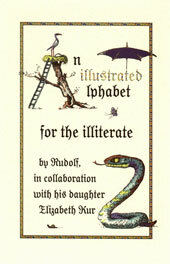 Then Rudolf and his daughter Elizabeth (who had just turned sixteen at the time) each wrote thirteen short vignettes, stories and poems to accompany the twenty-six letters. Their two voices are easy to distinguish: the old voice is silly and nonsensical whereas the teenaged girl sounds brooding, mysterious and melancholy. An ‘artist’s book’ for everyone, An Illustrated Alphabet for the Illiterate is a surrealist’s bonfire of language, and has all the makings of a cult hit. Think of it as another kids’ book for teenagers and adults à la Mother Goose Eggs: sunnyside up. A weird kids’ book for arty teenagers and odd adults. Remedial reading for the Junior High School level. Rudolf trained as a medical doctor in Germany, graduating in 1978, then relocated to New York City to study at the Art Students’ League forsix months in 1980. In 1983 he married and moved to the Orangeville (Ontario) area. 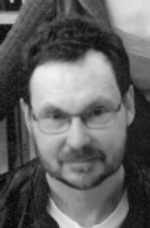 Rudolf was elected to the Ontario Society of Artists in 1994 which led to exhibitions at Painted City and J. Alfred Prufrock in Toronto, Circle Arts in Tobermory and Gallery House Sol in Georgetown. He also exhibits each year in Toronto at the One of a Kind Show and the Toronto Outdoors Art Exhibition. Rudolf’s carefully detailed, often bizarre and darkly humorous etchings and paintings are inspired by surrealism and the art of Medieval and Renaissance Northern Europe. A children’s book, The Rats Came Back, (Annick Press), was shortlisted for the Mr Christie Book Award (1995). Elizabeth Kurz is Rudolf’s daughter and co-conspirator. She was sixteen years old at the time of writing An Alphabet for the Illiterate. Elizabeth attended high school in the Orangeville area. She enjoys listening to the Velvet Underground, reading Daniel Clowes, and watching films about drug abuse. She hopes to pursue a career in the publishing business, or else travel in a caravan through the dark forests of Transylvania reading tarot cards and playing tambourines around bonfires.